1 For the cupcakes: heat the oven to 180°C (160° fan) 350°F gas 4. Grease a 12 hole bun tin. 2 Beat the butter, sugar and vanilla in a mixing bowl, until light and creamy. Add the eggs, one at a time and beat well after each addition. 3 Add the mascarpone and the passion fruit pulp (including the pips) and beat until smooth. 4 Stir in both flours alternately with the milk until smooth. 5 Spoon into the tins and bake for 20 minutes until golden and springy to the touch. Cool in the tins for 5 minutes, then place on a wire rack to cool completely. 6 For the passionfruit cream: whisk the mascarpone, cream and icing sugar in a bowl until blended and beginning to thicken. 7 Stir in the passion fruit pulp and beat until firm. 8 Spoon on top of each cake. 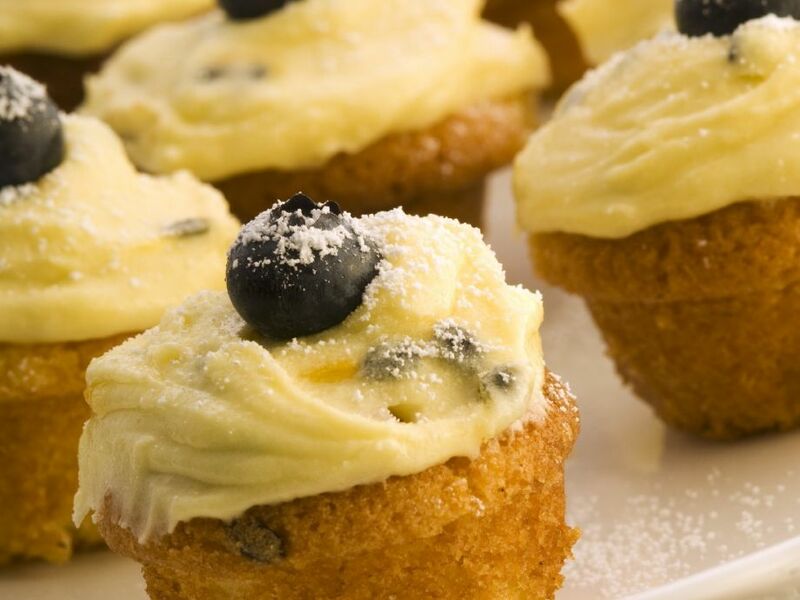 Place a bluberry on top of each cake and sift over a little icing sugar.